How’s it going? I’m pretty happy today because my new site finally launched last night. There have been so many hiccups & it’s not 100% complete, but I am glad to just be back online. What a fiasco! Feel free to check out the new layout here and let me know what you think. Are you in business and finally ready to make what you are WORTH?! If so join me on Periscope so that we can chat about it. – minor mistakes (yep, these are mistakes I made at one time too) that are preventing you from really having a breakthrough in your business. 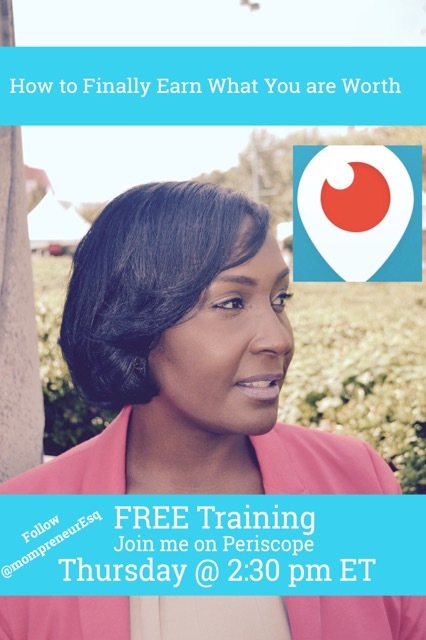 I am looking forward to seeing you on Periscope on Thursday at 2:30pm ET. No sign ups or opt ins required. Just be sure that you have the Periscope app and tune in. Follow me @mompreneurEsq. If you do not have the app you can get it on your phone via Apple app store or Google Play for your computer. Looking forward to seeing you on Periscope on Thursday! This entry was posted in branding, training and tagged business development, grow my business, how to earn more money, mompreneur, periscope, women in business on July 21, 2015 by MompreneurEsq.